There comes a time when using a snow shovel is no longer an option. The strain can be too much, or the snow has sunk too deep. But you need not worry. We have you covered on the best snow blower the market has to offer. We don’t want you to go through the hassle of trial and error that’s why we help you find just the right equipment. We have chosen these blowers because of their excellent capabilities, construction, reliability, and ease of operation. Every machine is unique to cover individual needs in snow blowing. These snow blowers use a plastic auger to scoop out snow and throw it out through the chute. They use electric power to propel the auger hence you have to push the machine as it blows the snow. This is because the engine does not assist the wheels. 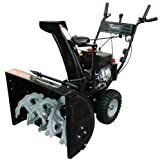 They are perfect for small driveways, deck, and walkway and cannot blow snow that is deeper than 8 inches. They are lightweight, and you can lift them for storage. Because they do not use fuel for the power, you get to work with a blower with simple maintenance procedures. These blowers use a 4-cycle engine for power. They have higher power than electric blowers. You can use them for average snow blowing of snow that does not go deeper than 12 inches. They are also lightweight since you have to push them. With them, you can clean paved surfaces except for gravel floors since they clean the surface. These machines are sophisticated. They use an auger with an impeller which drives out snow much faster. The impeller helps to mix the snow with air such that it breaks down faster. They are therefore ideal for all types of snow including wet snow and packed ice. They are also perfect for plowing through huge snow piles. Navigating with a two-stage blower is easy since the wheels are engine assisted. They work well in hilly areas, and slippery surfaces as the tires have better traction and are much thicker than those on electric single stage blowers. They require engine maintenance since they deal with heavy snowfalls and are prone to accumulating debris. The area you want to clean determines the snow blower you want. For light and fluffy snow, single stage blowers are ideal. Look for a blower which features a clearing width from 12-22inches wide and with an intake height of 6-18 inches. This way you can be sure that it is going to perform as the season’s change. When you want to plow snow out of vast areas, two-stage blowers with a clearing width from 22inches will work perfectly. If you are going to push a snow blower; ensure that the handles work for you. Even better look for a blower which allows single hand operations. This is where you can adjust the machine and blow at the same time. 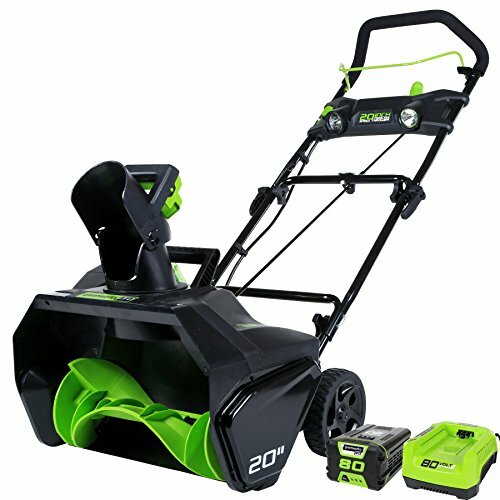 When looking to buy a gas snow blower, it is important that it comes with an electric start system. This is because getting the engine to run when the temperatures are freezing is going to be a real hassle. 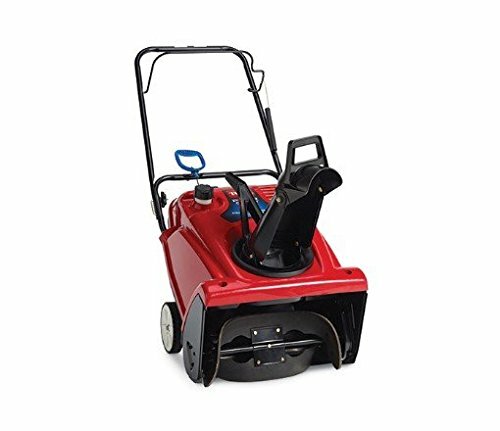 A snow blower with an electric start allows you to plug in a power cord, press a button on the blower and the engine roars to life. This again applies to heavy-duty two-stage blowers. A machine with power steering lets you guide it through the snow giving you superior maneuverability. When choosing a single stage blower, you’ll want to consider the weight. This is because with this type of blower it needs physical strength to push it. If the load is large and you are not able to work with it, the machine cannot work for you. Do you want to wake up before the sun is up or late after sundown? Either way, visibility is an important part of working efficiently. As the snow starts pouring in, it takes our attention to snow blowing equipment. A snow blower is the most effortless way of moving lots of snow from access areas. But why are they important? Save on time-the time it would take to move snow using a blower is half that you’d use when using a snow shovel. This equipment is ideal when you don’t have much time to spend moving snow on a busy morning. Effective- dealing with different types of snow calls for the tool that can perform up to the task at hand. If you want to move wet snow and ice, the only effective way is by using a snow blower. Hassle Free- you can say goodbye to back strain and fatigue that come with using a snow shovel. All you have to do is walk behind a snow blower, and it does the work for you. Two-stage blowers can use self-propelled wheels so what you do is just direct the machine to work for you. Snow Gloves– you don’t want to clean out snow and suffer hypothermia in the process. Invest in a good pair of gloves which are specific for snow blowing. Ensure they have ample insulation and that they are waterproof. Tire Chains– uneven surfaces and wet areas can cause serious slippage. Using tire chains will prevent the machine from rolling downhill. Heated Grips– if your blower does not come with warm handles you can install it with hand warmers. They are mostly compatible with two-stage blowers so remember to check yours before buying. Always check the oil after extended hours of use. If it has blackened, then it’s time to change to fresh fuel. Add a stabilizer to the fresh fuel. This is a remedy to keep the gas fresh for longer so that it does not clog the carburetor. Use a non-stick spray to help remove sticky snow much faster. Remember to replace the spark plug at the start of a new season. Inspect the tires for correct pressure. You can have it checked at the local repair shop or check it with a pressure gauge. Toro single stage snowblower has impressive features. It is ergonomically designed plus the clearing capabilities are exceptional. It is also lightweight, easy to handle and comes at an attractive price. Power Smart Snow Blower offers the best option for a two-stage machine. It yields high power to move massive amounts of snow with minimal clogging. It has been engineered with serrated blades plus the control panel is easy to navigate. The essence of a good snow blower is to have it work for you. You don’t need to take numerous breaks to unclog a blower. That’s where the Toro 18-inch Electric Snow Blower comes in. It has been developed to suit the first paced environment where we want things done fast and more efficiently. Working with this Toro model gets even better. If you encounter heavy snowfalls at night, you’ll be able to clear it out in record time. The blower can throw snow to 30ft. This means you won’t go over the parts you have blown the snow to ensure it is clean. With this blower, you can easily move snow over a path that is 18-inches wide in just one path. And not just that, the auger can sink up to 12inches. What more could you ask for? With a 160-degree directional chute, it becomes possible to throw snow where you want it exactly. No more moving the whole unit to direct the flow. You just use the deflector to position the chute in one of three levels that is the high, low or medium height. This way, you’ll not blow snow in one place and stress yourself when it’s time to move it. The beauty of this blower is in the capacity to clean down to the pavement. If your deck has had its share of winter, you can get it clean and ready for summer without waiting for the solar to melt it away. Your driveways, walkways and even the porch will benefit from this capability. The only reminder though is not to use it on gravel and rocky surfaces. When large debris enters the blower, they’ll clog the chute or even damage the moving parts. Toro is thoughtful of its users. You’ll notice this when you start working with it. First, it comes with ergonomic handles. They are designed to be of use with either hand. This means when it comes to lifting it will be much easier. Maneuvering has also been taken care of. It comes with 6-inch wheels which help the blower to move effortlessly on snow. Toro proves it can be relied upon when it comes to producing reliable power tools. With this blower, you get a balance of good ergonomics, easy handling, and durability. Because of the sturdy construction, it is deemed to last a considerable amount of time. This blower, however, is not for persons who cannot lift 25lbs. This is another incredible snow blower. It is a single stage thrower which comes with only one auger. It uses 13.5amp to provide efficient snow throwing. The motor has the most excellent features since it is quiet and it produces the power to blow snow over a wide area in a short time. You’ll no longer have to clean for hours just to have a small area clean. This blower uses an electric start. It has a button that you push after plugging in, and the whole unit comes alive. This means you’ll not be dealing with cords to start the engine in sub-zero temperatures. The button is convenient at your fingertips. It is located under the steering handle such that you’ll not fumble when you want to switch it ON or OFF in a hurry. It gives you the flexibility of working at the time you want as you don’t have to wait for the engine to warm up under better weather conditions. 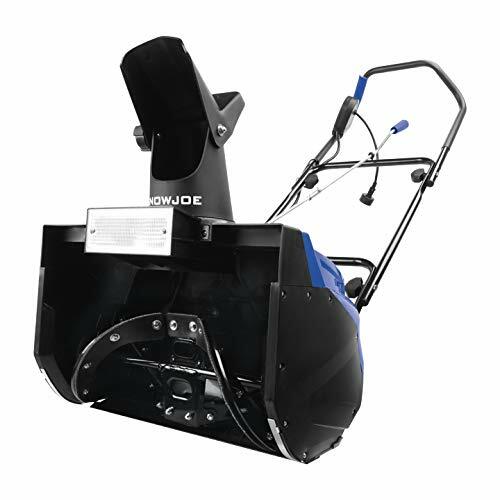 Designed with an adjustable chute and deflector, this blower is efficient in the quick throwing of snow. The chute can rotate over 180-degrees where you can change the direction using the deflector. It requires using the lever when setting it to the ideal position. Even better, you’ll not stop when making any necessary adjustments. The lever is beside the handle hence it is easy to touch and change as you blow. What’s more, this blower is furnished with four steel blades which can clean the surface. When it comes to maneuvering around the home like on your driveway, you get the assistance of sturdy wheels. Snow Joe ensures that you won’t be struggling when pushing heavy equipment in icy conditions. With the support of the wheels, your work is much more productive. You can eliminate time consumption since you expend less energy on moving the unit and more on ensuring it performs exceptionally in the process. It’s not just any snow blower that comes with a halogen light. But the Snow Joe features one bright light. As you know, winter can have the lights dim on you, and it’s still during the day. And when it’s time to go out you’ll be in a fix for not being able to get your car out of the driveway. With this blower, you’ll get rid of the snow blocking your garage door and even open up other inaccessible parts. The halogen light is a 20watt bulb that you’ll find useful in the most convenient hour. This blower achieves superior cleaning. It can discharge snow at rates of 650pounds per minute. At this rate it doesn’t matter whether you have one car or three, you’ll still be able to park them safely. It can clean 18-inches wide and 10-inches deep of snow in just a single pass. These are the capabilities that make this snow blower for medium duty tasks. A powerful snow blower is the best description for this blower. The efficiency provides a wider area of snow throwing in lesser time than with the Toro blower. Its capacity beats a single stage since with four blades and a directional chute it can work with the direction you want. GreenWorks Pro is arguably the most powerful cordless snow blower. It uses an 80V battery which means you’ll not be dealing with tackling power cords and fumes. It runs as quiet as a corded blower only that it is efficient. Power from an 80V battery boasts lots of pressure to throw snow to even further distances. This blower uses a brushless motor. It, therefore, has few moving materials hence the engine runs with high acceleration. This way each minute is spent scooping and expelling snow at exceedingly high speeds. You will not want anyone to be around such power since the rate of discharge can injure them seriously. The blower can move snow over 18 inches wide in one pass. This capacity is most useful when you need to clean out snow in a hurry. It can also go as deep as 10inches to remove every inch that your car tires could be buried. The essence of this blower is to eliminate the hassle of power cable. If you have wrestled with one in the past, at times we go for some change. Enjoy working with the Greenworks cordless snow thrower as you’ll no longer be confined to a certain location. You can blow underneath the car, up the roof and even the stairway without any struggle at all. Even better, it has a running time of 45minutes. This time is more than enough to complete the most tasking work you have. This power tool also comes with a directional chute. It can rotate over 180-degrees. With it, snow discharge does not become a nuisance. Instead, you identify the perfect location, use the crank and direct the chute in that direction. You’ll have an even snow pile which will also work to maintain the aesthetics of your home even if it’s winter. It has a throw distance of 20ft to make the whole process much easier. If you dislike working with a snow blower because of the maintenance, you are in luck. The GreenWorks Pro does not need any fancy procedures. With a dry cloth, you are safe to store the blower. It does not require fueling or emptying the tank and wiping off carbon. Since it uses battery power even the hand vibrations that come with powerful gas tools are eliminated. Greenworks has developed a line of products. But the most notable one must be this snow blower. It exudes high performance, reliability, and convenience. It is unlike any corded blower where you have to be close to the plug for it to blow properly. Do you live in an area where blizzards are usual in winter season? Well, you just wish there was a way to clean up all the snow outside the pavement in a short time. The Power Smart Two-Stage Snow Blower calls for attention from every feature. One, it uses a gas-powered engine for the best performance. You’ll be pleased to work with a machine that generates 208cc engine displacement. It is capable of handling virtually any time of snow. This is including the plow pile left at the end of your driveway by the municipal. It uses 6.5HP to clean out 24inches of snow in one pass. It has an intake height of 21inches to help get to packed ice and wet sticky snow. The good thing is that it uses 12-inch serrated steel blades which repel sticky snow. This blower comes with a control panel for the speed and changing direction. It has a 4-way joystick right beside the handles where you reach out to change the direction of the of the discharge chute. With the lever, you’ll also be able to maneuver with ease since you can control the four forward speeds. That is if you need to blow fluffy snow, high speed will work just fine but if you are working on the ice, you’ll need to be at a fair speed at high torque to slice through it. You also get to choose between two reverse speeds for even greater flexibility. As a two-stage blower, you’ll be able to use it on all kinds of surfaces. The skid shoes come in handy to adjust the height of the augers, so it does not scoop stones on gravel. It can also clean on dirt and frozen lawns provided you have the skid shoes in the correct position. Along with the tires, you can expect it to provide efficiency in all the areas you choose to blow the snow. More so because the tires are thick with a diameter of by inches, they achieve excellent traction on slippery grounds. 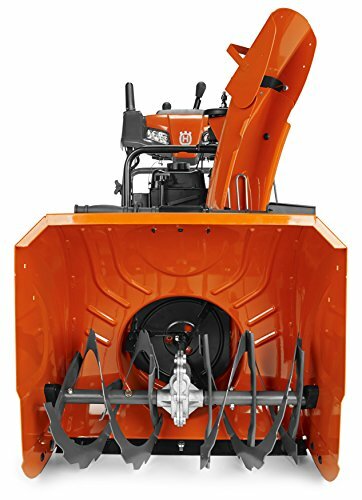 This snow blower is suitable for plowing through all types of snow. It can also move over any surface. It has the convenience of high-power and a robust auger system. If you can’t handle wet snow with a regular single stage blower, opt for this one as it will save you from dealing with blowing challenges. Husqvarna ST224 is designed with the user in mind. It is rated top quality because of the power to handle heavy snow in rough areas. This equipment comes with all the necessary features you’d love to see on a two-stage snow blower. From the throw distance to the fact that it can work efficiently on all types of floors; it can also plow large areas thanks to the vast clearing capabilities. If you have ever worked with a gas snow blower that won’t start you know the frustrations that come with it. But with an electric start mechanism, all you do is push the blower, and the engine comes to life. It is perhaps the most admirable feature on this unit since with fast start you’ll not consume time with a cord. When you can’t handle your blower, you can easily get injured. That’s why the Husqvarna comes with a simple control panel. With the friction disc transmission system, you can be sure that the operations are going to be smooth. This is because you won’t be dealing with belts. Instead, it uses a friction disc that connects directly to the engine. Thus, from the moment you start the blower then only time you stop will be when powering off to store the machine. This blower features a rubber auger. It first slices snow and mixes it with air to make it lighter before discharging it. This aspect reduces the chances of clogging. You’ll see improved flow as it does not require you to stop many times to unclog the chute. It comes with adjustable skid shoes so that you can plow on ice and grass the same way you would on a paved driveway. The Husqvarna brand exudes 208cc of engine displace on its LCT-4cycle engine. You’ll not be mixing any oil and gas when working with this blower. Instead, the oil and the fuel go in different chambers. You’ll like that it can blow snow over 24 inches wide and 23inches deep in one pass. This indicates the discharge rate is quite high on this blower. This power equipment features adjustable loop handles. They allow use with either hand while providing easy access to the joystick and speed lever. It also has heated hand grips to keeps you toasted as you operate this incredible machine. With the unique traction applied on the tires, the machine provides ample stability to enable working without skidding or losing balance. How well does the product clean the surface? Only the single stage blowers can clean to the pavement. They have plastic blades which rarely scratch the floor. The two-stage blowers listed here do not clean the surface. As such, they are perfect for all kinds of floors. Can the product work in a sloped area? The two-stage blowers can work on slopes and uneven grounds. They have large tires which bear excellent traction to prevent skidding. The tires are also propelled, so you’ll have better control. Each blower has a specific guarantee as follows: the Snow Joe, Toro, and Power Smart blowers carry 2years; GreenWorks comes with 4years while Husqvarna has 5yrs. We have delved into the best snow blowers. The features on these machines are exceptional for every homeowner. They are not only efficient but also reliable. You should expect the model you choose to work in the best condition for many winter seasons.